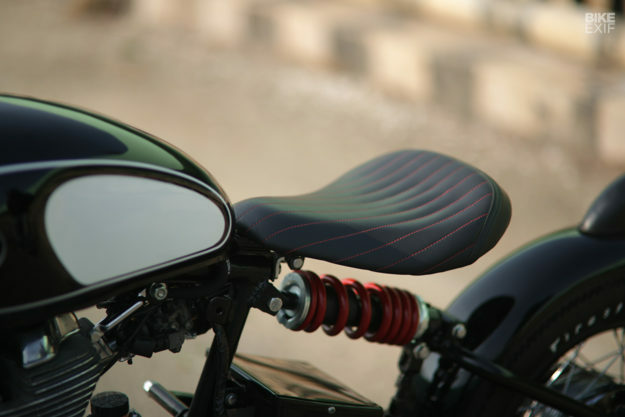 With the success of Triumph’s Bonneville Bobber, it’s a wonder more manufacturers aren’t pushing out factory bobbers. 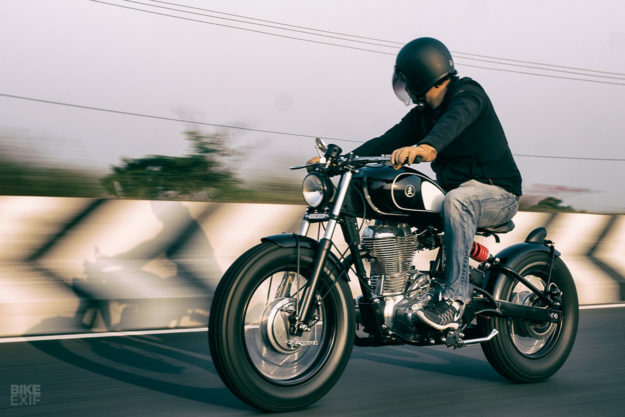 But the Royal Enfield Classic 500 is close to the mark, with a timeless, minimal design that’s a little on the utilitarian side. 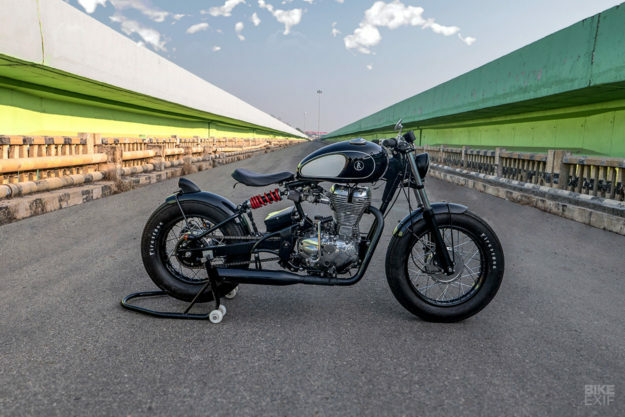 This bob-job from KR Customs is a superb example of what could be done, if Royal Enfield were feeling daring. 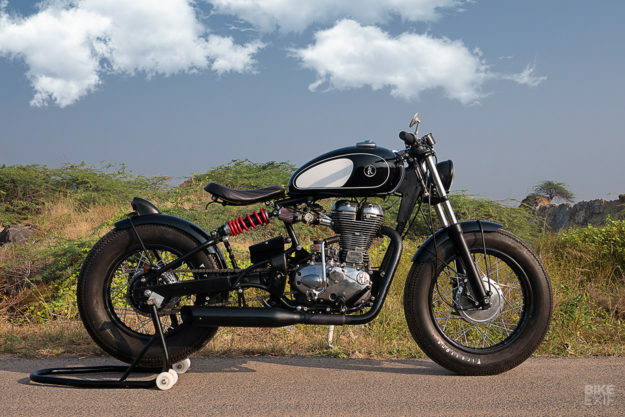 And KR Customs are even based in the same city as Royal Enfield’s HQ—Chennai, India. The shop opened its doors a few years ago, when founder Krish Rajan was relocated to Chennai by the IT company he worked for. 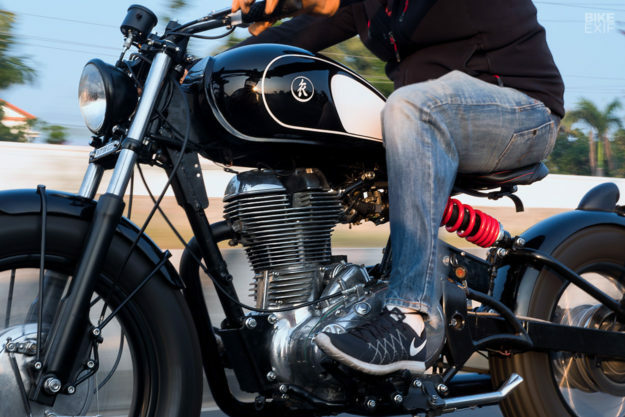 A lifelong motorcycle enthusiast, he decided to build his first custom bike, but couldn’t find anyone to help him do it. Krish acquired a second hand lathe, a gas welder and a pipe bender, and KR Customs was born. And even though Krish still holds down his day job, this is already their fourth build. The brief came via a casual phone conversation with their client, Vikas. He’s from Mysore, and was looking for custom shops in and around Bangalore when he stumbled upon KR’s website. The deal was cemented when Vikas and Krish discovered that they shared similar backgrounds and both had studied in North America before moving back to India. 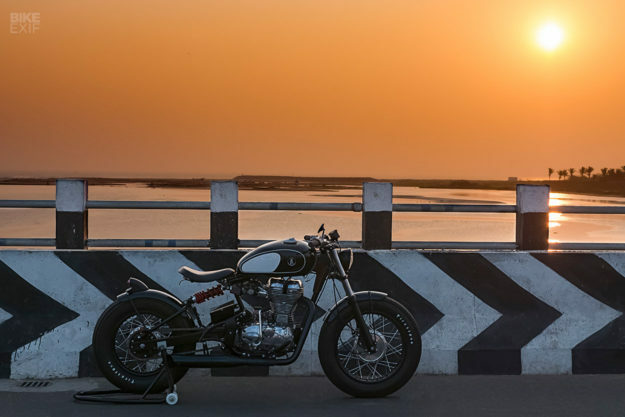 It only took a few days to source a suitable donor—a three-year-old Royal Enfield Classic 500. The KR Customs crew stripped it right down to the frame and engine, then started the rebuild with the rear end. KR have a ‘dual mono shock’ design that they’ve used in the past; a design that utilizes two shocks mounted right next to each other, with a custom three-point pivot system. For this build, they decided to tweak this to run as a true mono shock. Then they swapped the swing arm for a custom-built unit, made 4” longer to accommodate the new rear shock. Needless to say, the Enfield’s subframe found its way into the trash, and a solo seat is now perched on a cantilevered leaf spring mount. The leaf spring is a 1950s replica part, but the actual seat was built in-house. The Enfield’s original side boxes are gone too, replaced by a single battery box that houses an Anti-Gravity Lithium-ion battery. Extra consideration went into the 500’s wheelset too. The guys laced up a 18” front and 16” rear, wrapping them in Firestone Deluxe Champions. 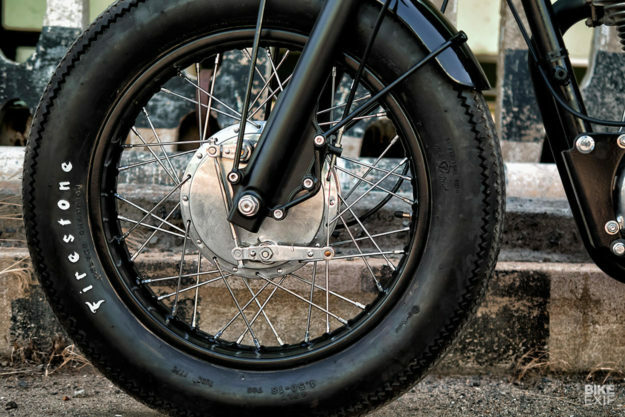 But they wanted the wheels to have a seriously vintage vibe, so they rebuilt a pair of Enfield drum hubs from the 50s. The front brake’s a true drum setup now, but there’s a disc brake out back. The vintage rear hub had to be put through the lathe to balance it, and modded to accept a disc and sprocket. 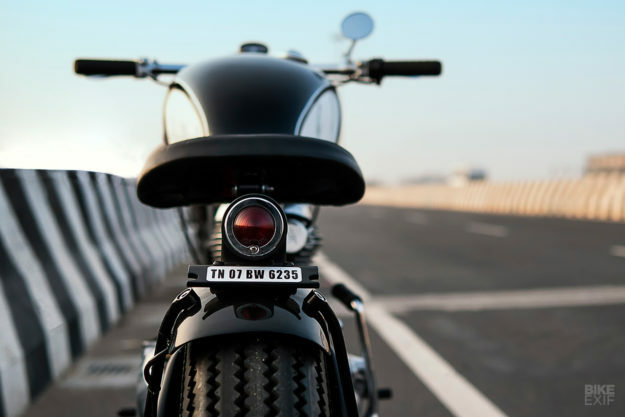 For the tank, Krish and his mechanics tried a few custom options, before settling on an OEM Triumph Street Twin unit. Krish found it on eBay while visiting the US, but the fitting was easier said than done: the guys had to cut and shut the bottom of the tank to accommodate the stock Enfield fuel pump. 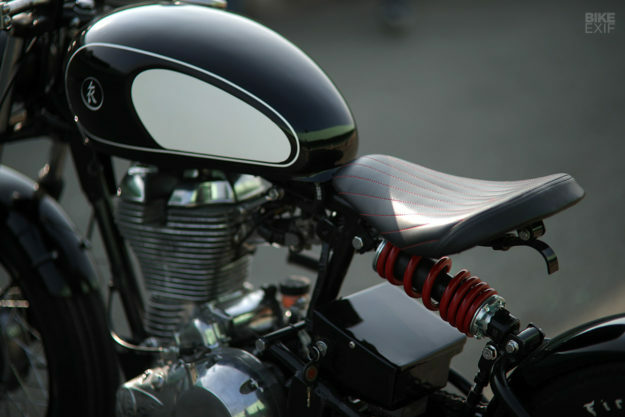 The cockpit’s been kept low and lean to match, with a set of drag bars adorned with a Biltwell Inc. throttle and grips. For switches, the team used a set of simple push buttons, mounted in custom-made billet aluminum housings. There’s also a Bates-style headlight and Posh turn signals. And the triple trees are off a Honda CX500—chosen because they have a small notch at the front that made tucking the speedo in a touch easier. 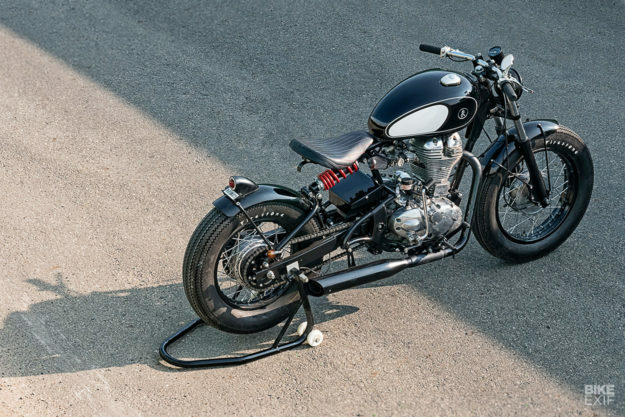 KR Customs kept paint simple with a subtle black and white scheme. 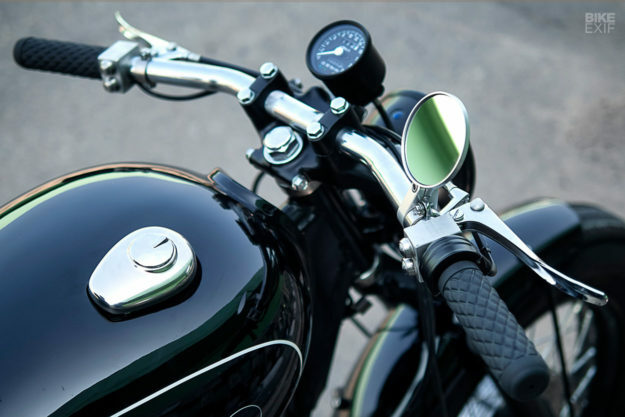 The engine casings were blasted and polished, and the custom-made exhaust and fenders finished in black.